Andrea is a Board Certified Massage & Bodywork Therapist and Spiritual Coach with a large toolbox of methods and techniques in the fields of Therapeutic Massage, Healing Bodywork, and Holistic Well-Being. She holds a M.Sc. degree in Ecology from the University of Vienna, Austria, and has completed advanced training in a variety of mind-body modalities all over the world, including Life Coaching, Spiritual Counseling/Non-Denominational Ministry, Craniosacral Therapy, Somato-Emotional Release, Hawai’ian Spirituality & Bodywork (Lomi Lomi), Compassionate Touch for Oncology, Geriatric and Palliative Care as well as Pain Management and Stress Relief. In her work, she provides an Oasis in the Overwhelm and mindfully creates individually tailored sessions that support her clients in achieving their personal healing goals by re-establishing balance in body, mind, and spirit. Andrea is a life-long learner and loves to travel all over the world, immersing herself into different cultures, healing modalities, and new experiences. She was born and raised in Vienna, Austria, and moved to the US with her husband Peter in 2000. Their three children have become global citizens as well and over the years they had many wonderful adventures together. Whenever her busy schedule allows, Andrea spends time in Nature, recharging her batteries and finding inspiration for her work. She loves to bake, read, write, play tennis, go skiing, and swim or snorkel in the ocean. She is a passionate singer and a big fan of musicals. As a true biologist at heart, she shares her house and backyard with a number of animals, including chickens, hedgehogs, cats, a Greek tortoise, and a pond full of fish. Her big dream is to open a Healing and Retreat Center in a beautiful nature location, offering an Oasis for people to heal, recharge, and restore their inner balance. In addition to running her own practice “Barefoot Aloha”, working with clients in different settings, and organizing healing/self care retreats all over the world, Andrea is very passionate about education and research to help establish the field of mind-body- therapies on a broader basis within the medical and therapeutic field. She also volunteers for an organization that supports victims of domestic and sexual violence in Monmouth County and serves on committees with the American Massage Therapy Association (AMTA) as well as the Massage Therapy Foundation (MTF). themselves. 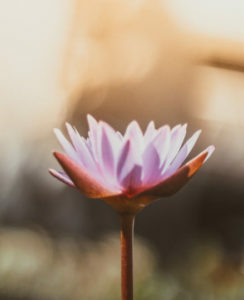 Through trauma-sensitive, gentle, and mindful bodywork, she supports them in connecting with the deep wisdom they carry inside, releasing stored trauma from their body, letting go of stress and pain, feeling really good in their own skin, and making self-care and healthy boundaries a priority.